YES, IT’S HERE! 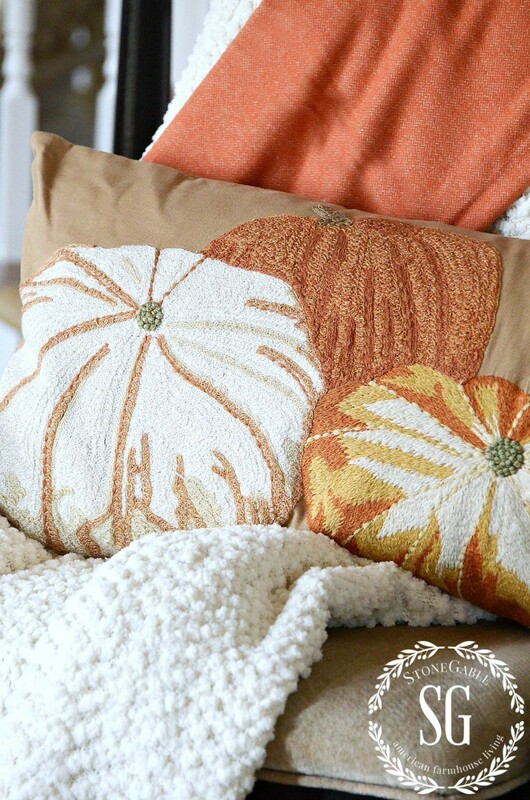 I know many of you have asked me if I was going to post my favorite fall pillows from around the web. And so to all of you who were asking… It’s here! I think the fall pillows are just absolutely gorgeous this year! Lots of hooked pillows and we’re still seeing lots of embroidery. This year I’m also seeing more interesting beading like the featured pillow! Simple but so gorgeous… and even better in real life! All you pillow lovers raise your hand! This is the perfect post for you! I’m wild over this fall pillow from Pottery Barn! Oh, so so pretty. It has a big appliqued pumpkin done in very subtle fall colors. It’s also so well made too! The Appliqued Pumpkin Pillow is on sale HERE. It works as the focal point of my sofa! This pumpkin pillow is back for another year! When I first posted this tri pumpkin pillow last year Pier 1 sold out of it completely in two days! Well, it’s back again and no wonder. It’s such a popular and pretty pillow! You can see it HERE. Here’s another amazing pillow from Birch Lane! I’ve been seeing lots of “hooked” pillow for fall and boy they are gorgeous. 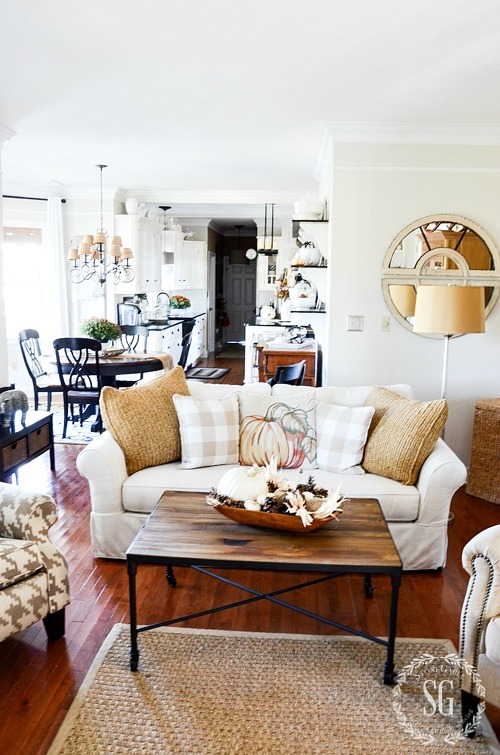 I love this one for its warm, cozy look! I have this pillow and it is even more beautiful in real life! So rich! 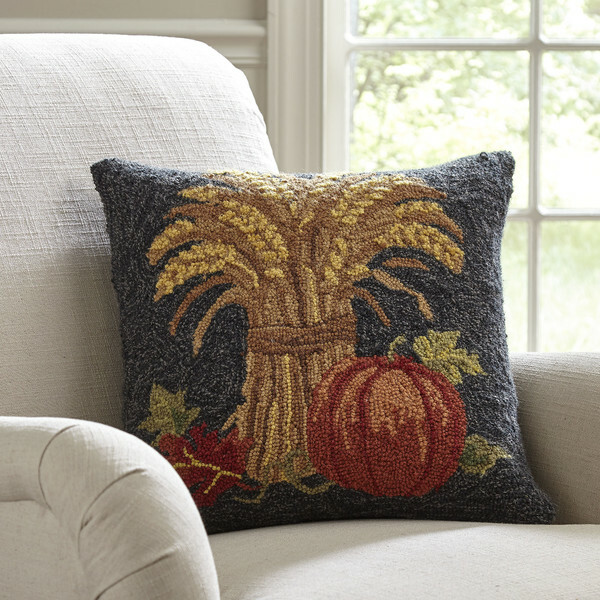 This pillow quintessentially fall! You can see it HERE. 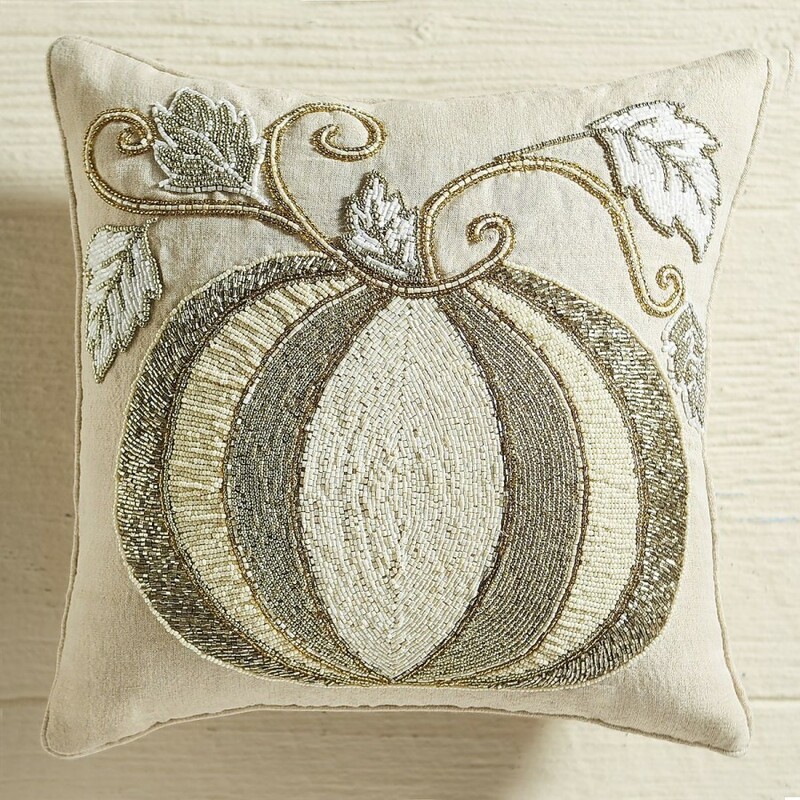 Here’s another embroidered pumpkin pillow I love! It’s a lumbar pillow and works great in the center of a bed or sofa or alone on a chair like the one I put it in below! It has such beautifully detailed work… and it’s on sale right now! 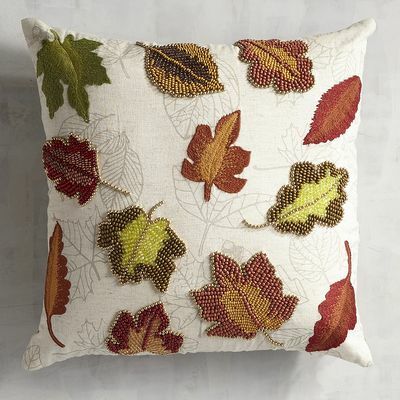 Click HERE to see this pretty fall pillow! More beading… so on trend right now. This pillow is gorgeous! A great way to update a room in metallic colors! See it HERE. 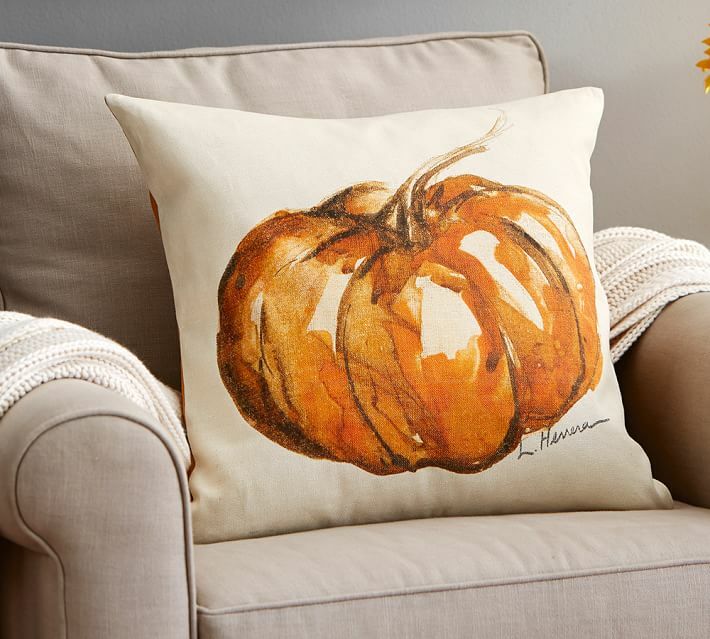 This painted pillow looks like it just came out of the pumpkin patch! Such rich color! Click HERE! Okay, just one more hooked pillow. Oh, this is so adorable! My family knows I dream of having an old truck to run around town and country in! See it HERE. And see the coordination throw HERE. This one is coming home with me today! A fabulous solid pillow is worth its weight in gold! Don’t you love the blanket stitching? Perfect for fall! The gold pillow is my choice for fall. I’d mix it with a patterned pillow! Want to see more? Click HERE. GORGEOUS! Look at the beading in this pillow. Falling leaves never looked so good! Click HERE to see this pillow. This pillow is so cool! 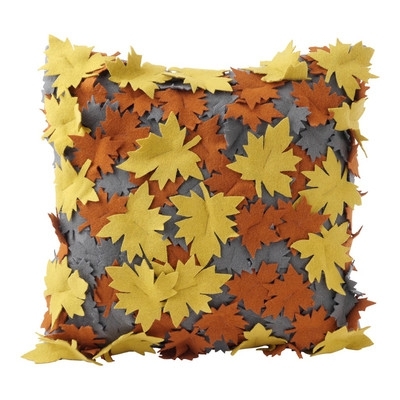 If you jumped in a pile of leaves as a kid, this pillow should make you smile! See it HERE. 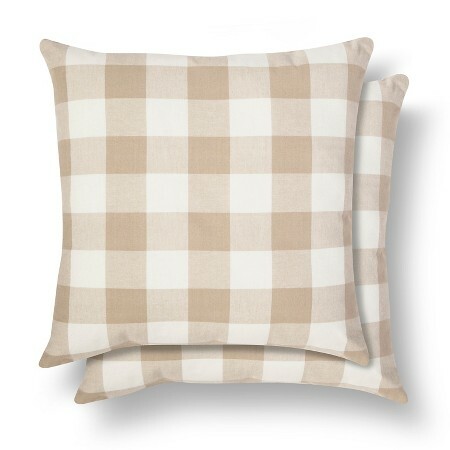 I also think having some great pillows like these buffalo checks are important! They may not be the showiest pillows but they serve as a coordinating backdrop for fancier pillows! We all need pillows like that! These are from Target and come in tan, black and red! See them HERE. It’s all about layering! I Think this beaded Thankful wreath is beautiful! See it HERE. 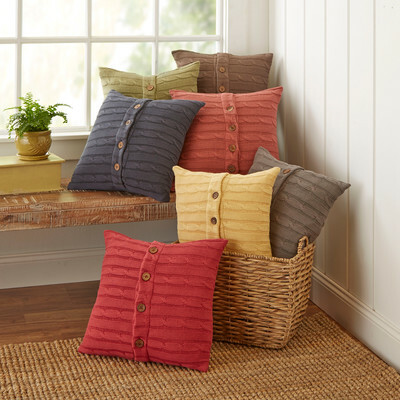 Don’t you love love love these cable knit pillows! I’m getting a few! See them HERE. 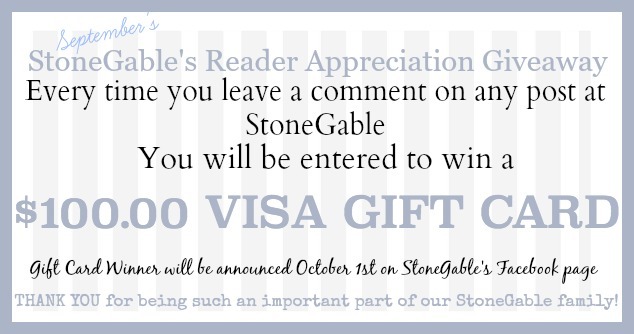 This is for all my beachy StoneGable fans! See it HERE. Now how are you using pillows to decorate this fall? 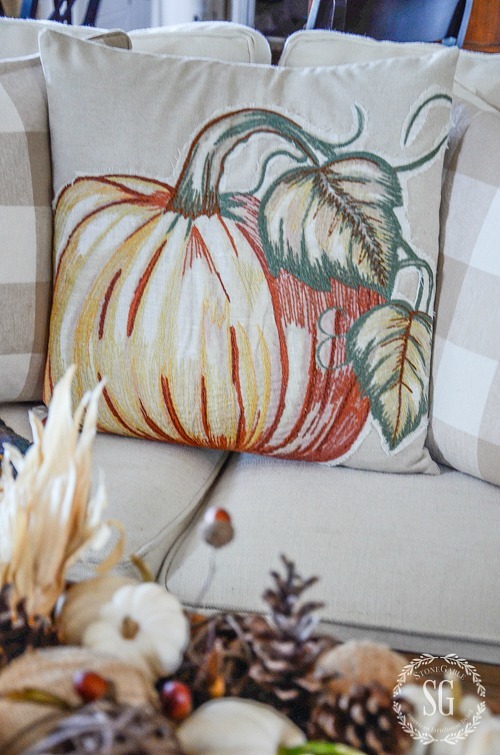 Stop back and I’ll show you more fall pillows in my home and how to use them! You might want to follow me on Pinterest and see what I am finding to pin every day HERE. Your pillows are just beautiful. Looking at them, I am ALMOST ready for fall !! I love the pumpkin pillows! I have had the same pillows on my couch for the last nine years. Two weeks ago I finally bought one new one. Now, after seeing this post, I’m going to find a pumpkin pillow! I love the green truck with the pumpkins! 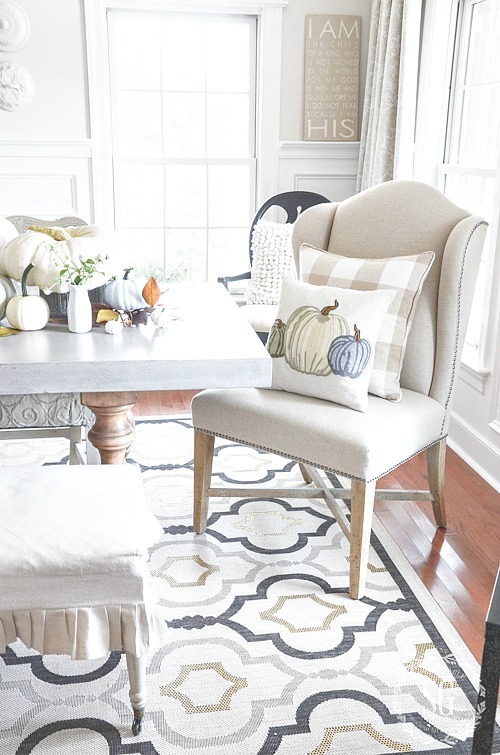 I also love the Blue and White fall theme you have for Thanksgiving. I am trying to incorporate it into my house but my cabinet colors are dark. But I love your site and going to keep trying. The pillows are all beautiful but oh! My fave is the one with the green truck. It has a story to tell! I love that Mary! It certainly does have a story to tell! that beaded wreath pillow looks like it would be easy to make. What a great collection I’m heading out to get a few for my fall decor. Love the truck one!! I only splurged on one this year! Wow, Pier 1 has a great selection of fall pillows. 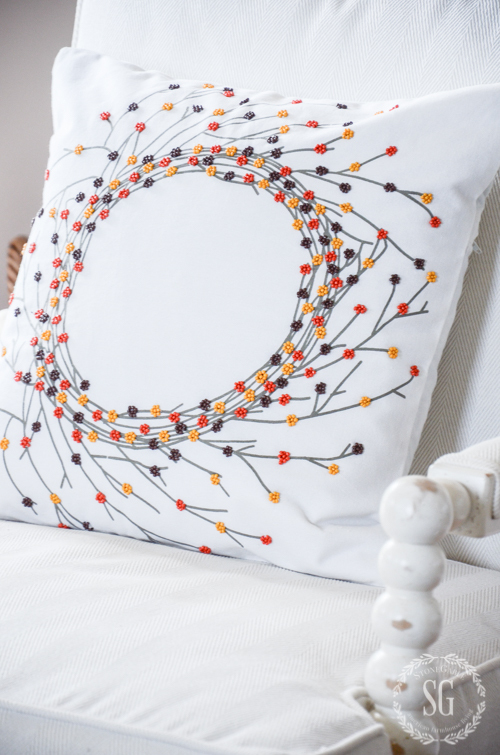 Pillows are beautiful…what a beautiful addition to decorating. Love, love the wheat one! Just Love love all the pillows!!! Love, love decorating with pillows, so many great ones here! Thanks for sharing, Yvonne, and have a great weekend!! 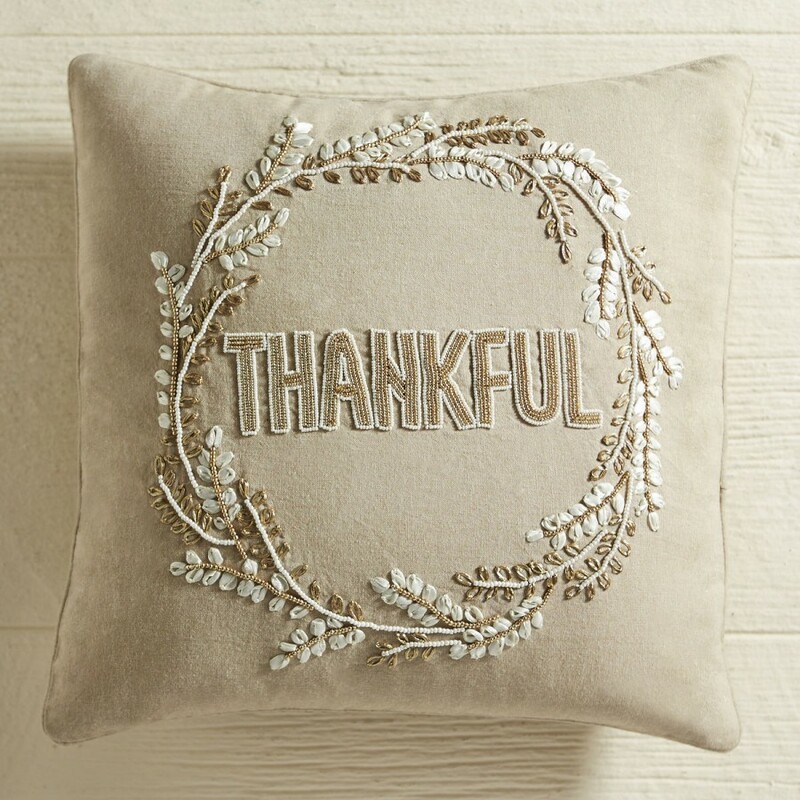 The Pottery Barn pillows have long been my favorite, but i have to admit the Beaded White Pumpkin Pillow from Pier One makes my heart pitter-patter! Oh I enjoy this kind of round up!!! I’m hoping there’s room in the budget for the green pickup pillow. Probably “lost” on my bro in law, but secretly I think he’d get s kick out of it. He has a ’48 original paint and he drives it!!! I do believe I’ll get it for him. And I’d never have snooped pillow places trying to find it. You did my leg work. Thank you again for a helpful fun post!! I did get a few new fall pillows and throw. It brings delight!! I love all of these! I too have pillow love. I am just not sure how to store my seasonal pillows. Yvonne, how and where do you store yours? I can’t afford all the pillows I want after reading and drooling over this post. Then I discovered the ANSWER. I’m going to cut out pictures of all my choices and put them on chairs, beds, couches etc. WOW, I can now enjoy all my favorites. Thanks Yvonne. You know I’m kidding right? Great post. You need to go to Sturbridge Ya Ke’e Workshop. They have lots of hooked fall pillows and some cute Halloween ones too. Also a doormat with the green trick and a pumpkin in the back…and its on sale!! I love the fall pillows but I am looking for some Halloween pillows, do you have any suggestions? HI Marlana, Pier 1 has fabulous Halloween pillows. So glad I found the pumpkin pillow from Pier One! It has a place of honor in our family room, I have been looking for a fall pillow that didn’t have orange and it definitely fit the bill! Thanks for the post!! Positively perfect pillows! Love this kind of post! Thank you for the time you spent putting this together for us, Yvonne. Love all the pillows you shared! I think my favorite is the one with the wheat! Love all of them–can’t really choose a favorite. I would love to have ALL the pillows. I think my favorite is the pickup. So cute! 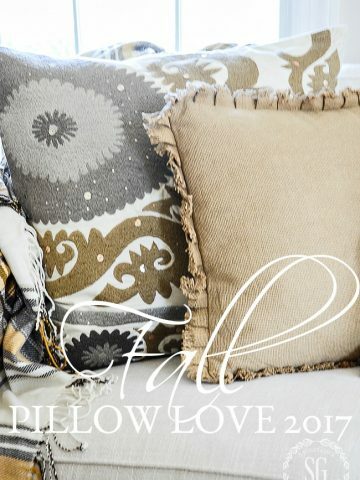 Love all of the pillows..and I adore the one from Pier 1 … I am using them this year…Such a great selection of Fall pillows. All the pillows are beautiful but my favorites are the needlepoint and hooked ones. Looking at all the lovely pillows makes me want to get out my thread and needle. Do a little embroidery with a Fall theme. I look forward to sitting down everyday and reading your posts. I have learned many things, and I really wish you were my next door neighbor so you could come over and help me! What a lovely collection of pillows and I want them all! You can never have too many pillows!!! Beautiful! I really like the pillow with the old truck too. So cute!! Gotta have the green pickup filled with pumpkins pillow!!! Love your fall pillows. Perfect for your house. You always do such a great job showing us the latest styles and trends. You also take such beautiful pictures! Love them all! I’m happy to see so many “old fashioned” pillows back in style. Beautiful pillows – thanks for including the link for each one. All these pillows are so lovely. I am having some fall pillow envy! Love these pillows. That one with the truck is so adorable. I have a Christmas one that has a truck with a tree in the back of it. One of my favs! Love coming to your blog for inspiration! So many pillows, it’s hard to choose a favourite. I do like the hooked pillow and the beaded ones also. Several of your photos are not showing! May be my computer, but thought you would like to know. I love pillows, particularly those that are seasonal. They are a fairly inexpensive way to add interest to a room and reflect the personality of those who live there. I love the green truck pillow as it reminds me of my sweet grandpa, he had a truck like that except it was dark blue. Thank you for all of the fall inspiration! I love all of the pillows!! Going to get a few for myself ..
Yvonne, Thank you for curating pillows for us. Just love your site and ideas! You are an inspiration! Gosh, I love pillows too! I learned some things about pillows today. I have some but never think too much about them. Now I see that they can be considered art & do a lot for a room. I like the soft blue-ish one! Oh my goodness, the pillow with the truck is so cute!!! An old pickup like that is my dream vehicle too. Who knew we had the same dream! The green truck is definitely my favorite because I have an old green truck! Oh isn’t it just the most adorable? Welll, you have done it again, Yvonne! Stunning! HI – great post. BUT – your link for the Thankful pillow takes us to the target gingham pillows – JFYI. Cheers. And just when I thought I had enough fall pillows – you post this and I see at least 5 more than i need! Thank you – now i need to get ordering! 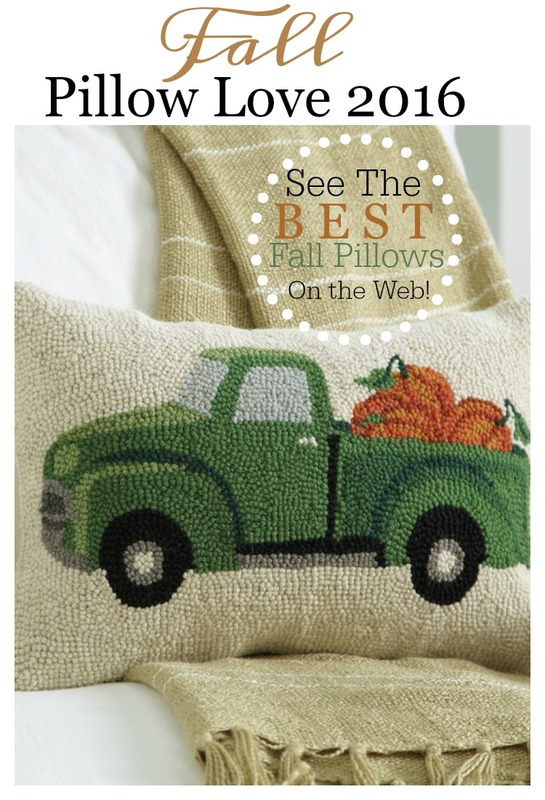 I love the pillow from Pier 1 and also the green truck with the pumpkins! Love all your pillows. They make everything so comfy cozy! All these pillows are beautiful. I can visualize a couple in my living room – but my favorite is the old green truck! Hope you get your truck one day!! Yvonne, you are the pillow queen! I especially love the hooked fall pillow. I might not be able to live without it! Thanks for all the beautiful pillow ideas. I can’t wait to get some for my home! I love the punches of color in the pillows. The morning briskness really puts that feeling of the upcoming holidays in the air. I just ordered some of the painted pillow covers from Pottery Barn earlier this week. The green truck is so cute. Such beautiful pillows! I love when you share the links too..thanks so much! What a gallery of fall pillows. I’ve never considered changing up pillows for fall. 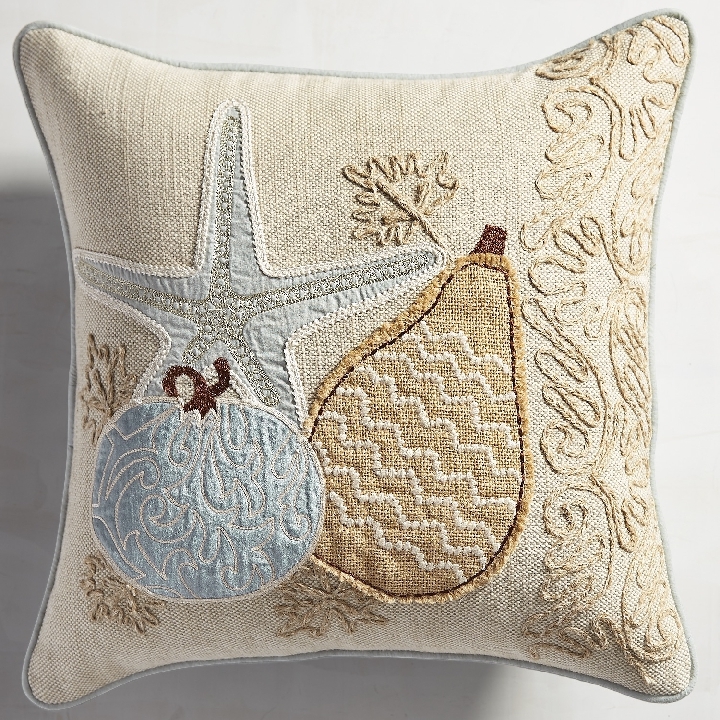 I’m headed to Pier 1 today to buy the embroidered pillow with the bluish pumpkin. Once again, your home is lovely and warm. The green truck is adorable but my favorite is the triple pumpkin pillow. It has better colors for me. Thanks! Just the inspiration I needed today! I’m off shopping! Thank you! Such beautiful temptations! Thank you for helping me get going on decor. I’m so happy to know I’m not the only one that is in love with fall decor, the pillows are beautiful and I have to have the green truck one,such a classic. Thank you for the wonderful inspiration. Love them all but my fav is the lumbar truck pillow!! I love all the pumpkin pillows! 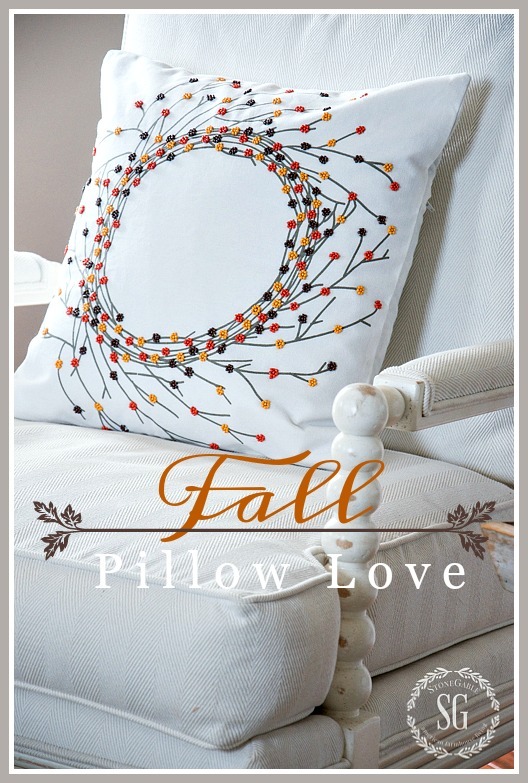 oh my goodness…fall AND pillows…two of my fave things! the cable sweater ones speak to me but the link goes back to the target gingham pillows….can you share the source for the wooly goodness? thanks! Thanks for letting me know about the link Sharon. I fixed it! I love them all but that little truck is tooooo cuuute! Thanks for sharing all of the great fall pillow options and ideas – it made me want to go pillow shopping! 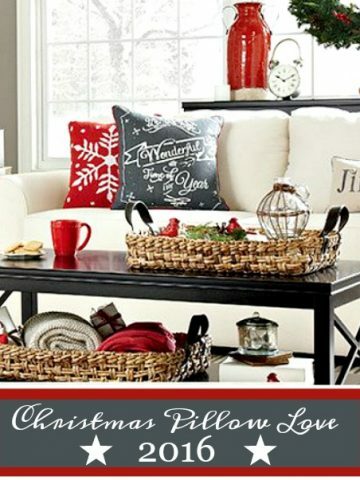 🙂 Love how you incorporate them into your home each season….. So many pillows – so little time – inspired to get busy. Love your decorating ideas – so beautiful. LOL! I agree with you! Oh my! So many beautiful ones to choose from. My favorites are the beaded wreath and the tri-pumpkin from Pier 1. Guess who’s going shopping! Thanks Yvonne! I love pillows also and all of these are so pretty. I am going to wait and see if these go on sale. Love them, but I am saving for Christmas, so my fun budget is tight! I’m on the lookout for Christmas pillows now! 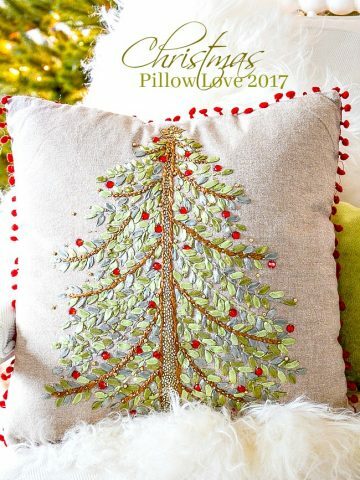 I’ll have a Christmas Pillow Love 2016 in the beginning of November. They are all beautiful! The gray hooked one with the wheat is gorgeous & the green truck is wonderful! Thanks for a great and timely post. I need to go shopping. The pillows for fall are beautiful! I like the pumpkin from Pottery Barn and all the rest of them also. It is fun to add a few every season so at some point, you have enough. Not really!! Yvonne, I love all your pillow selections for the Fall. Now I have got to go pillow shopping. Thanks for the ideas. I love all of the pillows too! I have that painted pumpkin pillow, I just love it! I also love the gingham pair of pillows. I’d actually love to have those. All of them are fun, pillows pillows pillows! One can never have too many! You find the neatest accessories. Thanks for sharing. Pillows can make a big statement in a room for a small investment. Hi Yvonne! I love all your fall pillows and how well they work in your decor. I especially love the thankful pillow. It has inspired me to make one similar to the one in your post. Thanks for the inspiration,your the best! Good morning! I really believed I had scoped out all the possibilities but you are good!!! Love, love, love everything you listed and thank you for the links. I have to have the truck pillow for sure and I think I better order quickly because it sounds like it was everyone’s favorite! Thank you for all the inspiration and hard work have an awesome day! I think the green truck is everyone’s favorite! I appreciate this tour of pillows, I cannot see myself spending $ 50 or more for a pillow, however do like your choices. Hi Velda, they will go on sale, so keep your eye out for the sales. Yes ! Pottery Barn has great sales on their pillow covers! After you told us about them I went to our local store, some covers were around 19.00! Thanks Yvonne for telling us! LOVE THE TRUCK PILLOW! I DON’T SEE A LINK FOR IT THOUGH! Hi Dawn, Look under the picture of the truck pillow. They are all so pretty it is hard to choose. I also love the old truck pillow. Thank you for the inspiration! Although they’re enjoyable to look at, I don’t buy special pillows for the holidays. These pillows are all pretty. I love the truck ! I think I have a pillow addiction!! These are beautiful. Sometimes I wish the Fall and Christmas seasons each lasted 6 months so I could continuously decorate for them!! Love the truck pillow. Adds that special touch of whimsy! Thanks for sharing. Thank you so much for this post I have more blues and grays in my home and I love that you found non traditional fall colors too. I too am going shopping! Such an array of textures and visual interest with beaded, embroidered, hooked and painted surfaces. I bought a leaf pillow similar to the one you shared last fall on sale from Kohls. It has a variety of cascading red, gold and green leaves, and it’s nestled on my sofa with some pleated solid gold pillows. I love the pillow you posted as your favorite. And I especially appreciate you posting the links. Going shopping now! Beautiful pillows! I like the variety of each of them! I especially love the beachy fall pillow. I think I might have to have that one!! Great post! This post is definitely for me! I think you and I have the same taste in pillows! I have a few of the pillows you are showcasing today! I’m obsessed with pillows, they seem to speak to me! Lol! I love to decorate will them. They make the whole room so cozy! Can’t wait to see how you use pillows in your home! Thanks for sharing, Yvonne! They are all gorgeous! 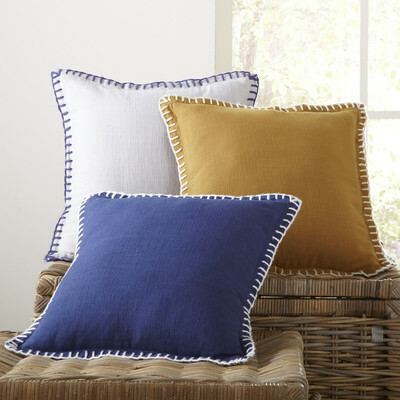 The pillows you use for layering – the checked ones, the whip stitch ones – they are all beautiful as well! “Support pieces” as I call them……you can only have so many feature items in a home. Love the green truck pillow too. Time to jazz up my sofa! I love them all too! The thankful pillow is calling my name. It would look great on a chair in my kitchen. I love your blog! So many beautiful ideas! 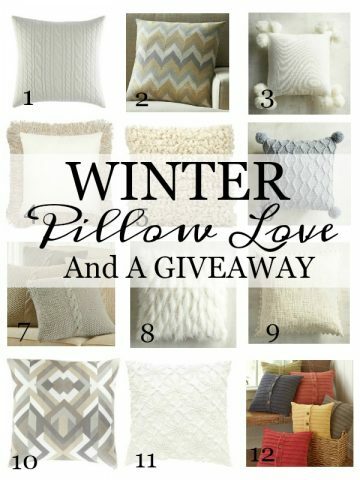 Love all these pillows especially the neutral pumpkin one on dining chair. Thanks for posting and giving the links. 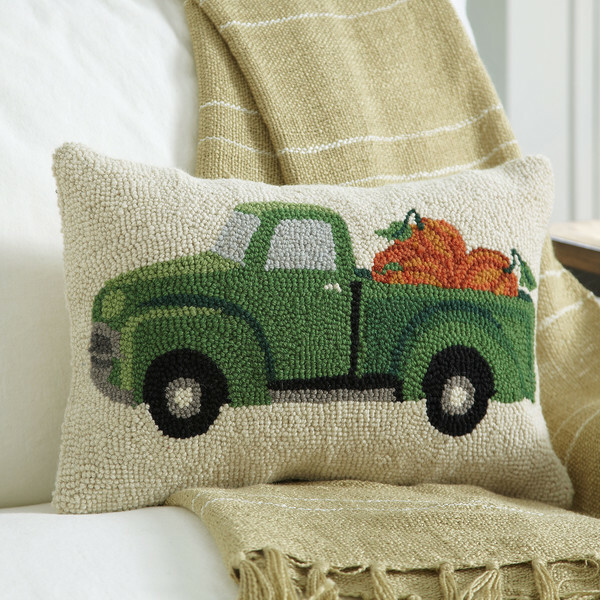 I love all of the pillows, but I think my favorite is with the old green truck loaded with pumpkins. Some how it just looks cozy. I know Tommie! It is just so adorable!